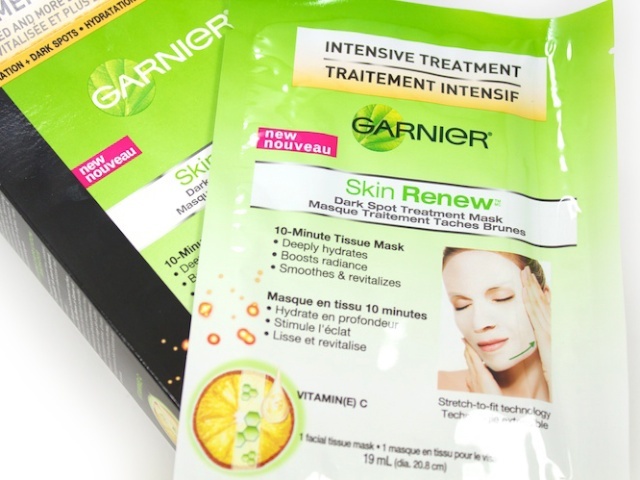 I love to treat my skin to a refreshing mask. Often it's just what I need to feel rejuvenated after a long week (or day). 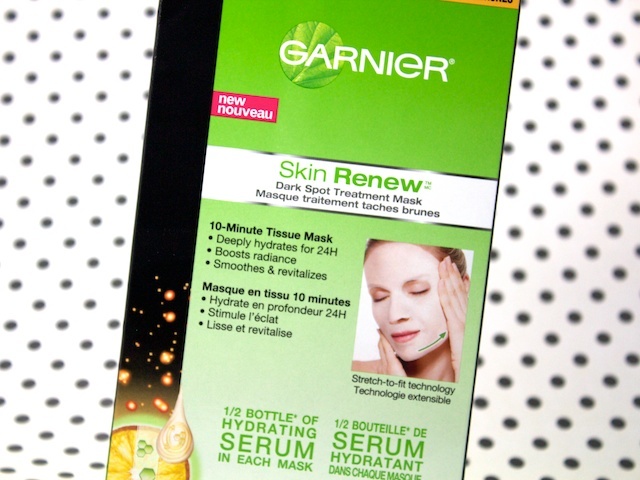 Lately, I've been loving the Garnier Skin Renew Dark Spot Treatment mask. This is the newest addition to the Skin Renew line & the third product I've tried from the collection. The other two being the dark spot corrector serum & the dark spot overnight peel. My favourite thing about this line is that their products are infused with Vitamin C (my skin loves that stuff). In fact, each of these sheet masks contain half a bottle of serum, which is about 15 mL. They're certainly drenched in it (but not in a messy way). It's recommended to leave the mask on for 10 minutes, but I'm a rebel & I kept it on for 20. I've always done that with masks, though. I've never encountered troubles and this time was no exception. There isn't much I don't like about it, so I'll start with what I do like. It's certainly refreshing. My skin feels hydrated & quite supple after use. I daresay even more radiant. The mask itself is easy to put on & it conforms comfortably onto the face (very much like a "second skin"). Now, the box claims that your skin will look brighter and more even after six uses in a span of two weeks (i.e., 3x a week). I have noticed a slight difference in the evenness of my skin, but I cannot definitively attribute it to the use of the mask alone. I think it's in large part to the skin regime I've begun recently. Regardless, I think these masks are great. If you're looking for a relaxing, Vitamin C infused boost to your skincare routine, I'd definitely recommend them. They are a bit pricey compared to Asian sheet masks. 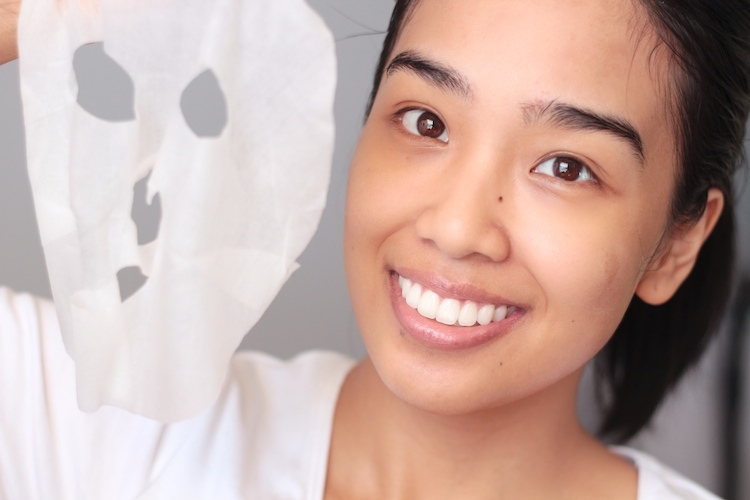 Depending on where you purchase them, you could be looking to pay upwards of $3 per mask. I picked up my first box at Shoppers Drugmart for close to $20 and then I picked up my second box at Target for $12.97. Awesome review! I've been really curious about these, I have tried any sheet masks before. im such a fan of asian sheet masks, i never go for anything else! esp since they only cost about $1 each. What's your new skin regime? Please share, your skin is amazing. That's SUCH a good deal! I saw singles selling for $2 at Walmart, but $0.99 is a steal!